This is an updated press release in regard to Sunday’s investigation into the possible manufacturing of Methamphetamine at 125 Renihan Meadows. While executing an initial search warrant at approximately 6:30AM, a male subject fled the apartment and attempted to escape through a basement door. Lebanon Officers were able to apprehend the subject after a brief struggle. The subject was identified as Jamie J. Judkins, age 42, of 125 Renihan Meadows. Judkins was initially charged with Resisting Arrest and Stalking, both Class A Misdemeanors. During this initial search, officers discovered materials that led them to believe that Methamphetamine was being manufactured on the premises, and the apartment was evacuated. Lebanon Police subsequently requested the DEA’s Clandestine Lab Team respond to assist in executing a second search warrant pursuant to a drug investigation. 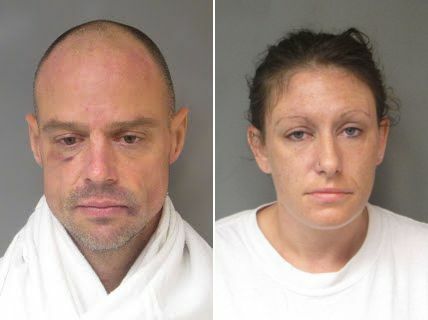 A search of 125 Renihan Meadows yielded a large quantity of Crystal and one-pot Methamphetamine, a large quantity of narcotic prescription pills and a small quantity of Marijuana. Methamphetamine pre-cursors were also recovered, along with drug paraphernalia. As a result of the secondary search warrant, Judkins was further charged with two counts of Possession of a Narcotic Drug with the Intent to Distribute, both Class B Felony charges. Tristdonna L. Copp, age 36, of 125 Renihan Meadows was also arrested and charged with two counts of Possession of a Narcotic Drug with the Intent to Distribute, both Class B Felony charges, and Hindering Apprehension, a Class A Misdemeanor.